As the temperature dips to the low, low digits (my office was colder than an igloo this morning), I have warmer climes on my mind. A restaurant that evokes warmth and which is cosiness personified is Lunya Manchester. An independent restaurant and bar, it also happens to be a multi-award winning deli. Their deli deserves a standalone post, so expect that shortly. Located in the magnificent Barton Arcade, the grand building had me doing my best goldfish impression as I gaped in awe at the stunning architecture. The heritage-rich building is in perfect synergy with Lunya, whose cuisine celebrates the traditional (in Catalan cuisine). Did you know Catalan food is one of the most ancient cuisines, with the world’s first recorded cookbook coming from this region? (I have a thing for old cookbooks, which is why this fascinates me.) 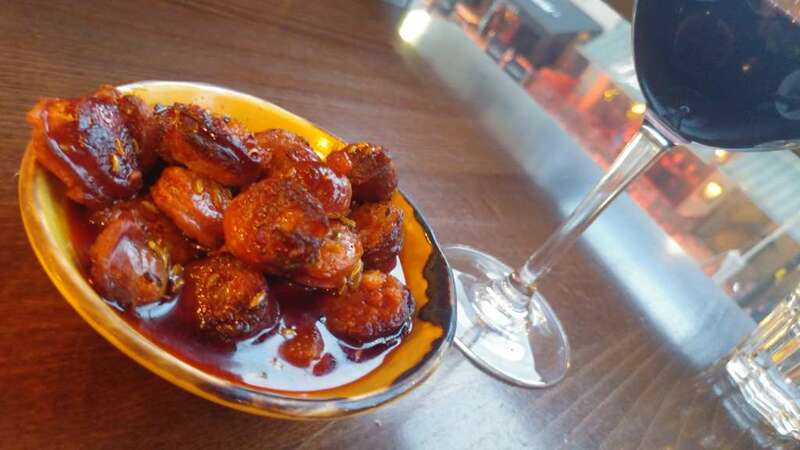 Influences over the centuries from the Moors, Romans and Greeks have created a fusion that is now cooked with passion and finesse at Lunya Manchester. The restaurant is set over two floors; deli and bar on the ground floor, and restaurant and kitchen on the first floor. When it gets warmer, there is also exterior covered eating space, should you be in the mood for al fresco dining. The day of the review was a Friday evening. Weary from my journey from Derby, I had my travel-case in tow and was efficiently seated upstairs. The waiter offered to carry it up the stairs for me, which was a chivalrous touch. Be it on a plane, or at a restaurant, I’m a sucker for a good window-seat. I find it is prime position for a spot of people-watching. I’m with Shakespeare, who famously said people-watching was one of the most underrated things one could do. Enjoying the lofty view from our first floor table, I loved seeing what Friday night looked like in central Manchester. When out reviewing, I always like to see what sort of people are attracted to the restaurant. As the evening progressed, I glanced around the restaurant and noticed a mixed crowd including couples on date-night, suits having business meetings, and larger groups enjoying Friday night. Appealing to a diverse clientele is a pain-point for many eateries, yet Lunya doesn’t seem to have a problem with this. 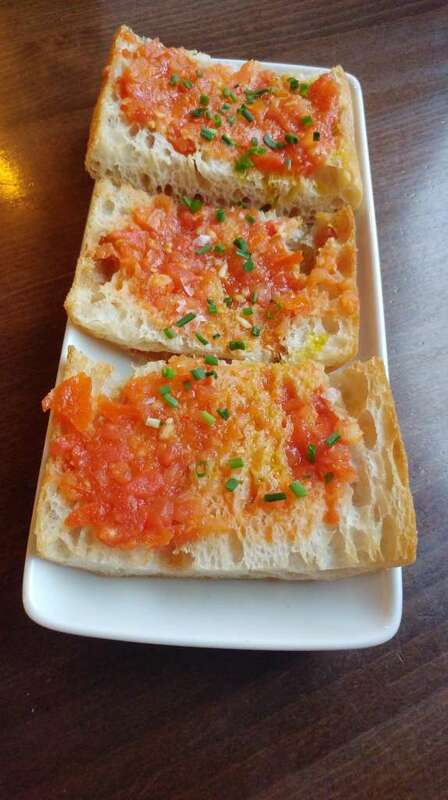 We started with Catalan tomato bread and Pan allioli. 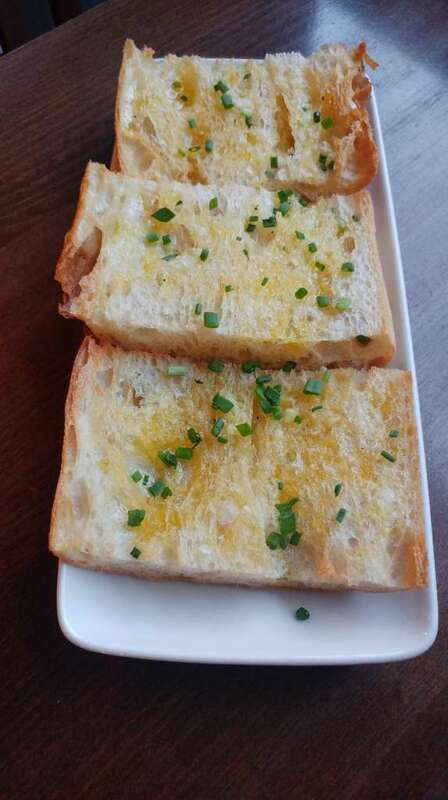 Crisp bread with a yeasty tang was delicious, the tomato version accentuating the zestiness of this dish. 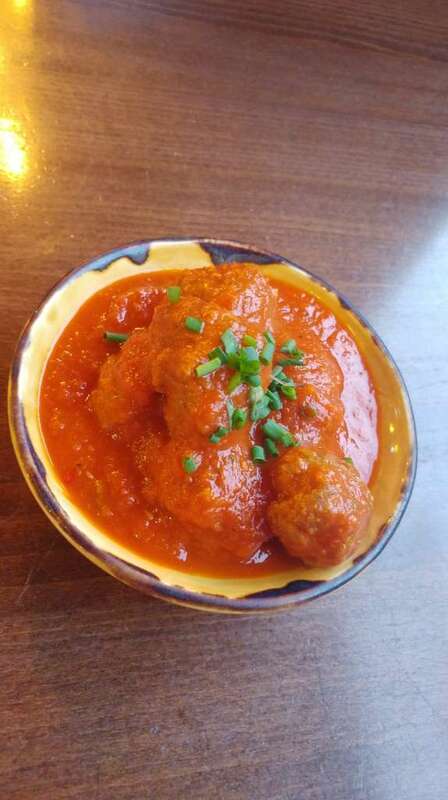 Albóndigas were meaty morsels with a nice hit of paprika, which took a few seconds to come through. Nestled in rich, unctuous tomato sauce made this dish the perfect companion to the Pan allioli. Chorizo made to Lunya’s own secret recipe was delicious. Delightfully chew discs steeped in white wine were good. I didn’t have that many of these, due to the presence of fennel seeds. I am personally not a fan of aniseed or fennel flavours, yet could appreciate the excellent cooking of this dish. Dining partner enjoyed the chorizo, which meant I could have more of another dish. 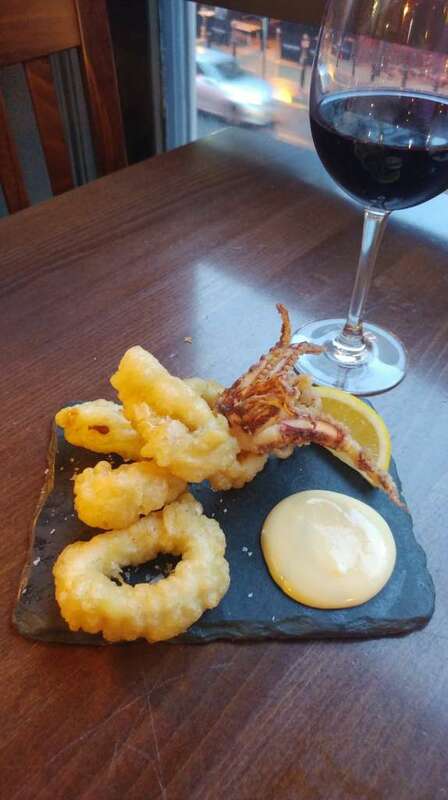 Beer-battered calamari was a joy to eat, crisp on the outside, and with a nice bit inside. 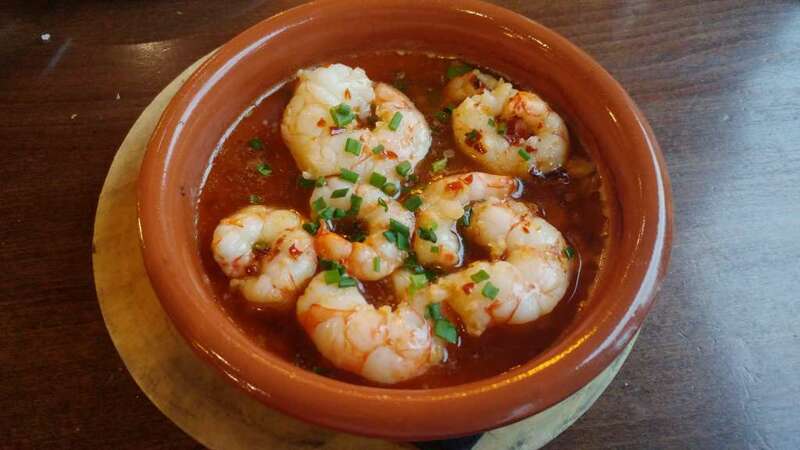 Gambas Pil Pil was a gorgeous dish which I enjoyed in all its bubbling glory. I love King prawns, and them being presented in a cazuela of garlicky hot olive oil was a treat. The gentle heat of guindilla chilli married well with the garlic, making this one of my favourite dishes. 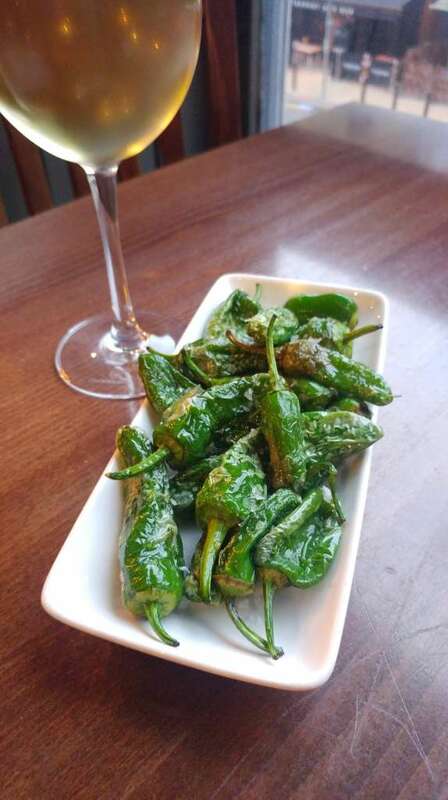 Ordering Padrón peppers is like playing Russian Roulette – you just don’t know what you’ll get. Channelling my inner Dirty Harry, I whispered as surreptitiously as I could (I didn’t want to freak out my waiter): “Do I feel lucky? Well do ya punk?” whilst biting into the luscious flesh of the peppers. My asbestos palate can handle a fair amount of chilli heat, which is why I would have liked more than the grand total of only two hot peppers. I nevertheless enjoyed eating these Galician green beauties. 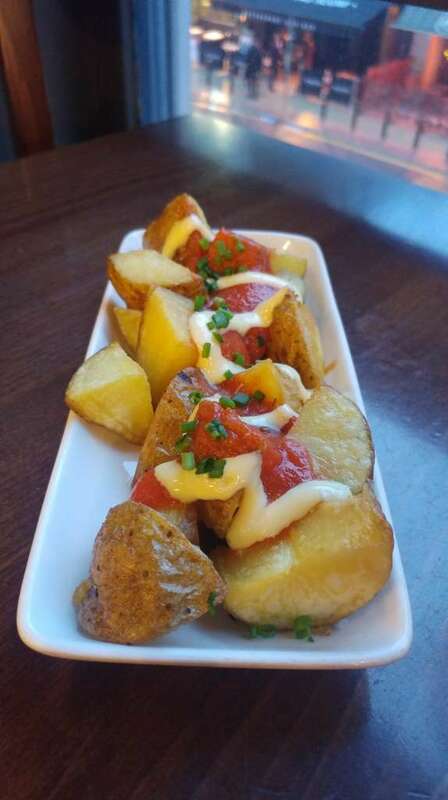 Patatas bravas too, were crispy and good, whilst the spicy tomato sauce and allioli brought the dish together nicely. Home-made churros sprinkled with cinnamon and sugar were delightful and also very hot. The cup of extra-thick hot chocolate was very good and felt like a luxurious end to an exciting meal. Warm cherry and ripe plum tempered with cream were notes coming through in this 16 month matured wine. A great companion to chorizo and patatas bravas. I would recommend sipping on a cool winter’s evening too. Fresh lemon and fragrant orange zest comes through on the swallow. I would recommend drinking this alongside calamari, Gambas Pil Pil or seafood in general. Dark chocolate covered biscuit and honey drizzled figs were the deliciously pronounced notes here. Went perfectly with the chocolate-dunked churros. A key focus of Catalan food is simple presentation of fresh ingredients and Lunya doesn’t disappoint. 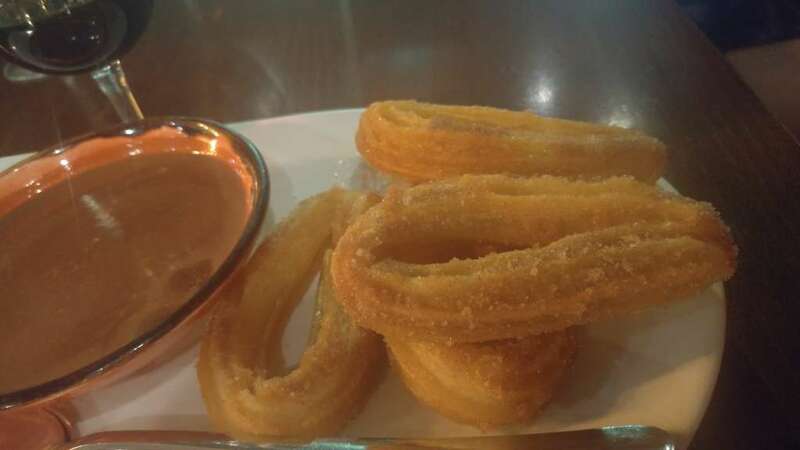 Dishes are cooked to perfection – I am still thinking of their churros laced with cinnamon. Service is attentive, informative and the wait-staff should be applauded for making diners feel at home right away. Dining at Lunya feels like a treat, which is why I would highly recommend a visit here stat. All finish times are the times of last seating of tables. The restaurant closes approximately 1 and a half hours later. The deli is open all of this time. Wheelchair friendly: Yes, inform the restaurant when booking, as dining can be arranged on the ground floor (where there is also a disabled toilet). Caters for dietary requirements: Yes. Quietest table: There is a private dining area available.